8 August - A cold start. The temperature was down to 11C at 7am, and the day's high of 20C was achieved by 1pm. It was a dry day with sunny periods and a westerly breeze. 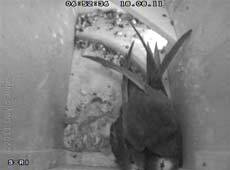 An overnight power cut meant that the webcam was knocked out of action for a few hours, and there was no recording of nest box camera output until after 6.40am, but I suspect that I missed nothing as both parents looked very settled until the first of them decided to leave at 7.31am. It hadn't returned when its partner left for (probably) the first time at 9.06am. Despite that late start they had returned with food a total 23 times today by the time they retired for the night at 9.04/9.05pm. 9 August - Another cold start, with the temperature 12C at 7am, before a slow climb to a high of 21C in the late afternoon before falling back down to 15C by 9pm. It was mainly sunny, but with a north-westerly breeze. The cool start didn't seem to put the Swifts off too much and the pair left for the first time at 7.12am. 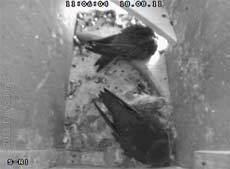 Perhaps they discovered an emergence of insects somewhere, because they returned to the chicks 27 times today before retiring for the night at 8.56/9pm. During the morning one of the chicks left the nest cup of its won accord for the first time while the parents were absent, and this was repeated twice more before the end of the day. 10 August - A bright, predominantly sunny day with a high of 22C and a steady breeze from the west south-west. Despite the apparently good conditions, and an early start ( 6.19/6.20am) in SW-ri the parents from brought food back to their chicks only 17 times today, returning for the night at 8.50/8.51pm. There were just a few excursions of the the nest cup by a chick today. 11 August - A mainly cloudy day with the occasional spots of rain, and feeling quite muggy. For some reason today was one of the quietest so far in SW-ri. The parents left the box together at a late 8.52am and that was the last I saw of them all morning. One returned with food at 1.45pm and then the pair arrived together at 2.35pm. By the time they arrived back for the night at 8.45/8.47pm the pair had made a total of just eleven visits between them. For the first time the microphone picked up very quiet squeaking (rather than chirping) for one of the chicks. This continued after the parents had retired for the night. 12 August - Another gap to fill - a variety of reasons, but not the tiredness excuse this time. As usual I've maintained my record of daily activity along with video clips to provide images as I do the catching up! In the meantime I've added a quick summary of activity for each of the last four days. Today has been largely cloudy, especially during the afternoon, although it stayed dry apart from a few drops during the evening. The temperature crept up from 16C around 7am to a high of 21C in mid-afternoon, and the breeze swung from westerly to south-westerly in the morning. After two slow days in SW-ri, feeding was back on track today with the parents returning to the nest 21 times. They left for their first trips out at 7.32/7.41am, and finally returned for the night at 8.47/8.48pm. The chicks are becoming more vocal now, although they are still too quiet to be heard from the driveway below the box. And while there is the occasional exercise of wings, mainly by the older of the two chicks, they continue to spend most of their time in the nest cup while their parents are away. 13 August - A mainly grey, if dry day with the best temperature (20C) during the morning. The breeze was south-westerly. The drop in temperature once again slowed down feeding activity by the parents. This morning they stayed in the box until 8.41am, and by the time they retired for the night at 8.42pm they had returned to the chicks 16 times. While the chicks still spent most of their time in the nest cup we are seeing more brief excursions onto the box floor taking place, and on a couple of occasions the chicks left the nest to greet a returning adult, although they were quick to return to the nest. 14 August - A bright and mainly sunny day with no rain, a westerly breeze and a high of 22C. The adults in SW-ri started early this morning, leaving at 5.52/5.55am. However, with the temperature not getting above 15C until after 7am it may have been a false start as they were both back in the box by 6.25am and didn't leave again until 7.49am. 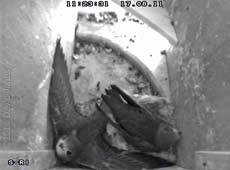 It turned into a busy day for them as they had returned to the nest 26 times by the time they settled for the night at 8.52pm. While I have been able to go through the recordings I have not had much time to capture images, but I thought it necessary to include an image to show how the plumage of the chicks has developed in just a few days. Gone now are the tufts of down seen in the colour photograph. Instead they are well on their way to developing their flight plumage. 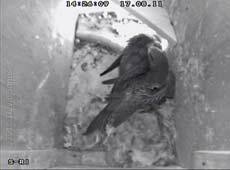 Now they are also very likely to head out of the nest cup to greet a parent on its return, and at least one regularly leaves the nest cup and reverses to back corner of the box nearest the entrance in order to defecate. It was interesting to see that after feeding a chick one of the parents spent time cleaning a bit of the floor - I think it ate a couple of faecal sacs. A few days ago I mentioned the quiet noises made by the chicks after the family was settled for the night. Tonight, as I write this the sound from them is almost constant, albeit with peaks and troughs as one of the family becomes restless and then settles again. Here is a sample of what the microphone is picking up, with the rumble of distant traffic in the background. The clip lasts 1 minute and has a file size of 939KB. The sounds cannot be heard from the driveway, below the box. Could these be nasal rather than true vocal sounds? 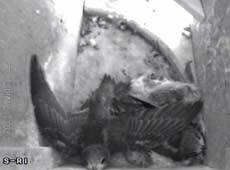 I should point out that during all this time the chicks are buried under the adults, and at approaching 11.30pm the sound continues! As an aside, and added here in the absence of the garden diary this summer(! ), a note to say that over the last two days I have given the Hawthorn tree a major trim - something that was long overdue! 15 August - The day started bright and sunny, albeit with a somewhat chilly start (11C at 7am). However, by early afternoon dark clouds were rolling in on the south-westerly breeze, preventing the temperature from getting above the 2C it had reached by noon. There was light rain in the evening as the temperature dropped to below 15C again. Activity in SW-ri followed the weather pattern, although the parents weren't put off by the cold start, leaving together for the first time at 5.33am. 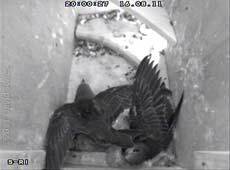 They returned with food several times before spending over an hour with/on the chicks between 6.31 - 7.42am. 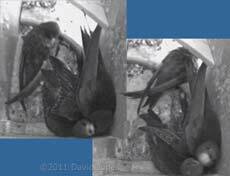 During that time quite a bit of mutual neck preening went on, involving both adults and offspring. Here a chick receives and then provides the 'service' as the other adult prepares to leave. After that session the rest of the morning was pretty busy and by noon the parents had returned to the box with food 15 times. Things slowed quite a bit in the afternoon, with just 7 visits seen between noon and 6pm. 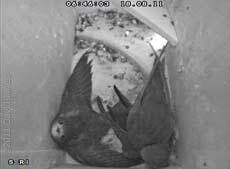 By the time the pair retired for the night at 8.31/8.34pm they had returned to the box a total of 27 times during the day. The chicks continue to spend nearly all their time in the nest cup, leaving it mainly to defecate. I think that on a couple of those excursions the chick took the opportunity to look out as it passed near the opening. There were just a couple of wing stretching sessions seen today, but this one was enough to show the amount of progress made since a captured a similar image yesterday. 16 August - Another grey day, with the temperature rising form 12C at 7am to 20C by the middle of the day before dropping to around 16C by 7pm. The sky remained clouded over, apart from a few glimpses of sunshine in the afternoon, and there were a few drops of rain in the late evening. The breeze was from the south south-west. The swifts were clearly affected by another glum day, and presumably a shortage of insects. They left early, at 5.23/5.27am and between them returned five times by 7.06am. However, when they pair left at the end of a joint visit at 8.20/8.25am they stayed away until one of the pair returned at 4.08pm. During the evening both parents returned numerous times and by the time they retired for the night at 8.42/8.44pm they had returned to the nest a total of 16 times during the day. The chicks were rather quiet today with just a few sessions of wing exercising seen, including this one when for the first time I saw both chicks involved at the same time. I must apologise for the failure of the webcam - a bit of a mystery this time, with no power cut to blame and the webcam software working as normal. There must have been a momentary problem with the video connection to the video interface that caused the image to freeze. 17 August - A dreary, overcast day with light rain from time to time, especially in the afternoon. The temperature rose from 12C at 7am to a high of 18C by noon, dropping back to 15C by 7pm in a light east-north-easterly breeze. By 8.30pm there were enough breaks in the cloud to allow a touch of red sky in the west. Despite the gloom the adults made 29 returns to the box today, a record number for the pair, from first departures at 5.34/5.36am until final arrivals at 8.34/8.36pm, with no long gaps between visits. and at least five times today one of the chicks looked out of the entrance, with its sibling close behind in this case. 18 August - Following yesterday's record number of visits, today we saw a record low number in bad weather. My son tells me that there was sunshine before 7am, but soon the skies were grey and the rain had started falling. The temperature of 13C at 7am turned out to be the high for today, and between 1-2pm it was down to 11C before climbing back up to 13C later. The breeze varied from between north and north-east. Perhaps the sunny start coaxed the parents into leaving the box at 5.51/5.54am. The first returned at 6.01am, and in this image one of the chicks appears as though it is showing off its wings to its parent, which is covering its sibling. By the time its partner appeared at 6.51am the rain was starting to fall. 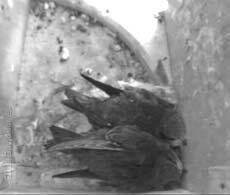 While it wasn't particularly wet, it wasn't long before all four family members were in a huddle on the nest cup. One of them left again at 7.21am, its partner remaining on the chicks until 10.10am before it too headed out. In the gap that followed, and which lasted the rest of the morning, the chicks were not particularly active, but just once one of them headed over to take a look out, as well as have a quick wing stretch before returning to the coziness of the nest. One of the pair returned once more (looking very wet) at 12.06pm, staying for 17 minutes. The next appearance by an adult was at 1.24pm, and when its partner returned at 2.27pm the day's aerial activities came to an end, with the adults having returned just five times today. Apart from the sounds of feathers rustling as the birds change position, the chicks are remaining rather quiet tonight, with very little of the sub-song(?) that I've been hearing each night since I first recorded it. 19 August - Welcome sunshine after yesterday's miserable weather. It was cold first thing, with the temperature just 9C at 7am, rising to a maximum of around 20C in the early afternoon before dropping back down to 15C before 9pm in a south south-westerly breeze. 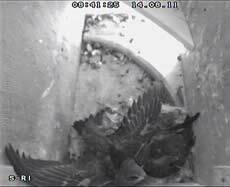 The early chill meant a bit of a staggered start in the nest box. One parent left at 6.09am, returning four minutes later, and then it wasn't until 8.27/8.28am that both adults left to embark on quite a busy day, By the time they finally returned for the night at 8.38/8.42pm the pair had returned to the nest 26 times.